The Piano Tutor was a project by previous STUDIO fellows Marta Sanchez, Annabelle Joseph, and Roger Dannenberg. It is an expert tutoring system designed to teach beginning piano skills and basic musicianship. The aim of the project was to develop a highly interactive and innovative system which emulates and supplements professional piano teaching. It provides computer based instruction to beginning piano students. Intended as a supplement to traditional instruction, the Piano Tutor helps students by correcting mistakes before they become ingrained through practice and by teaching new material as soon as the students is ready. The Piano Tutor combines an expert system with state of the art music recognition software and multimedia output devices to provide a simulating learning environment that tailors instruction to the student’s needs. 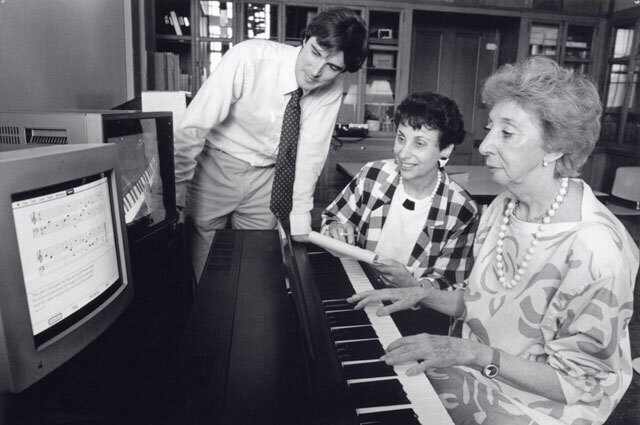 The Macintosh-based multimedia system teaches beginners how to play the piano. To the enhance interactivity and student interest the system uses a variety of input and output devices. The devices include an acoustic or electronic piano, a videodisc player for both still and motion video images, computer graphics including music notation, digitized audio for speech playback, and real time music synthesis. A mouse is also available for graphical input and selecting options from menus. 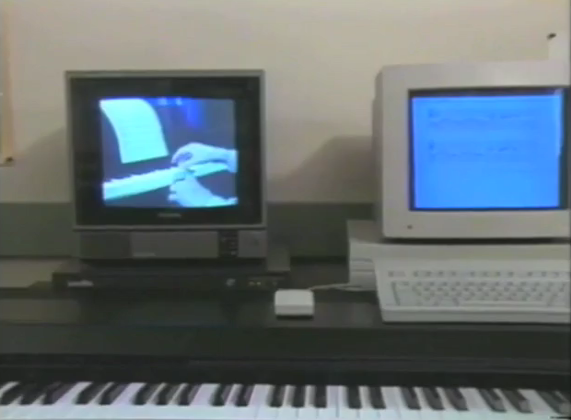 The system is running on a Mac II with C and CommonLisp, a Midi interface to Yamaha Clavinova, and a Videodisc player and monitor controlled by Mac. Lessons typically consist of a presentation (e.g. a short lecture recorded on videodisc) and an interactive task. 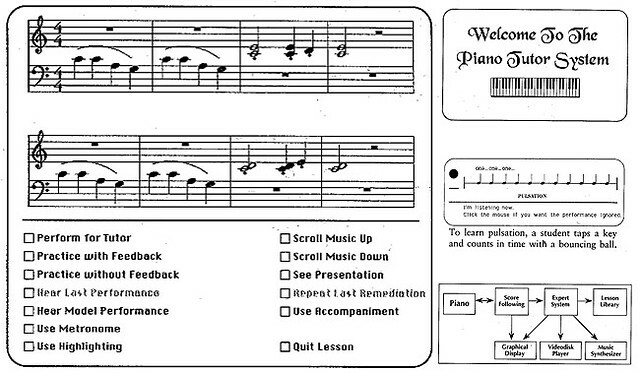 The student is then recorded, the Piano Tutor follows a graphic score , highlights notes, and turns “pages”. The system interrupts the session based on error conditions as erratic tempo or too many wrong notes. After the session the system evaluates the performance and gives corrections advice. The Piano Tutor was supported by the Markle Foundation.